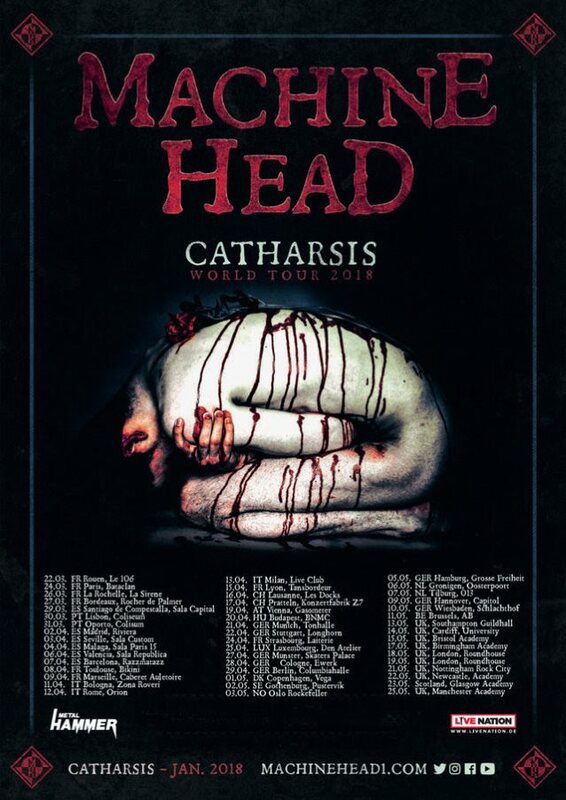 San Francisco Bay Area metallers MACHINE HEAD have announced a European tour in support of their forthcoming ninth studio album, “Catharsis”, which is set for release in early 2018 via Nuclear Blast. MACHINE HEAD‘s ninth full-length album, “Catharsis” was recorded with Zack Ohren (FALLUJAH, ALL SHALL PERISH) at Sharkbite Studios in Oakland, California. MACHINE HEAD‘s latest track, “Is There Anybody Out There?”, cracked the Top 40 on the Active Rock chart in the United States in August 2016. It marked the first time any Nuclear Blast artist has entered what is widely considered to be the “official rock chart” for the United States, and only the the third time the band had charted in the Top 40 in their illustrious career. MACHINE HEAD last year wrapped up the tour cycle for its first Nuclear Blast Entertainment album, “Bloodstone & Diamonds”, where the band toured for twenty months and performed a whopping two hundred and eighty-three concerts on five different continents around the world. Around two hundred and fifty of those shows were performed as “An Evening With MACHINE HEAD,” with no support bands and performances often lasting two and a half to three hours. Three tours of the United States, three tours of Europe, (including multiple dates in Russia and Greece), shows in Mexico and South America, a completely sold-out run of nine Australian / New Zealand shows, sold-out dates in Japan,and their first-ever plays in Taiwan and Thailand, and all without any festival performances which the band publicly announced they would stop performing at in 2014. “Bloodstone & Diamonds” debuted at No. 21 on The Billboard 200 chart with 19,000 sold its first week.